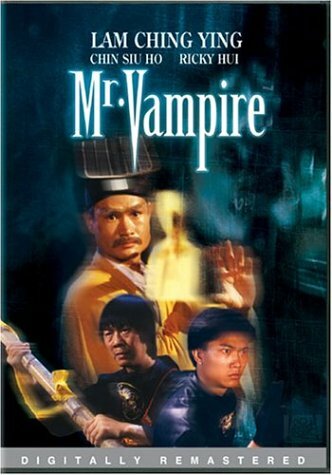 Ricky Lau's Mr. Vampire is the greatest Hong Kong, kung-fu vampire comedy ever made. This may sound like a ludicrous claim, but the film was so popular in 1985 Hong Kong that it inspired an onslaught of sequels and rip-offs. This original, newly released on a remastered Region 1 DVD, has a loopy energy that made me laugh and applaud. Lam Ching-ying stars as Master Ko, an elder priest and vampire hunter. A rich man hires him to re-bury his dead father, but this simple task turns into a nightmare, as the corpse turns out to be a vampire. One of Master Ko's apprentices turns into a vampire (Ricky Hui), while the other (Chin Siu Ho) falls in love with a beautiful female ghost. These vampires operate by different rules than our Western ones: they can get their bloody job done with their fingernails as well as their fangs, and sticky rice can stop them. The film has two spectacular fight sequences that blew me away, one featuring the headless ghost, and the other with the Master battling the ghost and his vampire apprentice at the same time, while the smitten apprentice tries to protect his beloved (he doesn't realize that she's a ghost). The film has that overly lively drawing-room slapstick of many HK films, but as balanced with the darker material, it works well. DVD Details: Fox's new DVD comes letterboxed with excellent English subtitles, and five audio options (English 5.1 and DTS, Chinese 5.1 and DTS, and the original Chinese mono, which I chose). The disc comes with trailers for all five titles in this Fox Home Video series. In addition to Mr. Vampire, there's Jackie Chan in Battle Creek Brawl (1980), Ronny Yu's The Postman Fights Back (1982)starring Chow Yun-fat, Sammo Hung's Knockabout (1979)and the classic The Iron-Fisted Monk (1977), Hung'sdirectorial debut. The price tag for these titles, $10, can't be beat.